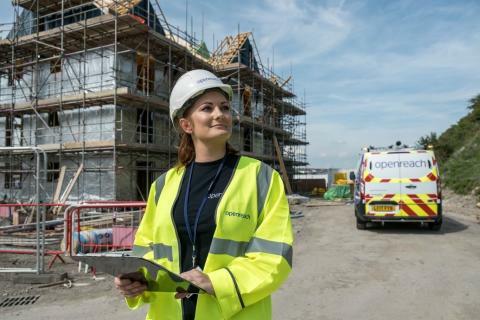 A partnership between local residents and Openreach, the business responsible for Britain’s largest phone and broadband network, is to make high-speed broadband available to more than 80 households on a new housing development in Elland. The cost of the new technology has been covered by investment from Openreach and the residents themselves, who set up a crowdfunding scheme to raise their portion of the funding. The co-funded deal is the 400th to be signed as part of Openreach’s UK-wide Community Fibre Partnerships (CFP) programme, with the first residents due to get the higher broadband speeds in around a year. The programme is bringing fibre broadband to some of the UK’s most challenging areas. Nearly 200 CFP schemes are already live. Hazelmoor Fold resident Kev James, who led the campaign for the upgrade, said: “We moved into Hazelmoor Fold about a year ago and discovered that unfortunately no fibre broadband was installed at the time the houses were built. There are many people living here who work from home as well as many families using streaming video services and the speeds we were getting just weren’t fast enough. As Hazelmoor Fold is a relatively new development, it was not included in any commercial roll-out of fibre broadband by the private sector in the Elland area. However, it was too early to be part of a new initiative, in which Openreach provides ultrafast fibre-to-the-premises (FTTP) broadband to all new developments of at least 30 premises. Derek Richardson, Openreach programme director in Yorkshire and the Humber, said: “We know how important fast internet is to communities. Whether it’s streaming TV in the home, doing homework online or downloading large files in the office, superfast broadband makes doing anything online faster. With a choice of many broadband providers and the variety of services and prices they offer, the Openreach network provides real choice. It’s great to know that when it goes live next year, this new internet connection will be helping to improve the quality of life for residents in Hazelmoor Fold.